My name is Mark Myers and I have always been a firm believer that humor can be found in nearly everything. I plodded along for 46 years under the delusion that my life would only contain smiles and laughter. Until April 9, 2014. 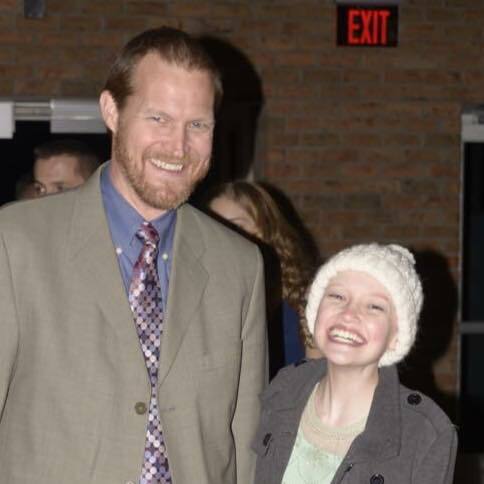 That day changed my outlook forever as my youngest daughter, Kylie was diagnosed with cancer. She fought bravely with a smile for ten months until her battered body succumbed to the disease on February 13th, 2015. Since that day, I have seen and cried more tears than I ever imagined. And yet, what I watched in Kylie was a remarkable ability to steal joy from her dreadful circumstance that I want to emulate in my grief over losing her. I have been married for over two decades to a very patient woman. Besides Kylie we have three daughters who are now much more mature than me. In fact my wife and I never had a son but she still tells people she ended up raising a boy. Go figure. Despite Kylie’s loss, I am a very optimistic person. I love Jesus, being a daddy, building things, running, writing, blowing stuff up, and anything else with a high guy factor. Living in the aftermath of her death is incredibly hard, as any parent can imagine. Before her illness, I had written three fiction books in the humor genre about a mischievous little guy named Virgil. My writing is now dedicated to her as I navigate these waters. I try to be genuine and honest about my pain while always leading with a smile, just like my baby girl taught me. I am learning that laughter and tears can coexist. I have had the pleasure of speaking in several forums about the need for more effective cures for childhood cancer and also about stealing joy from a difficult journey. You can see some examples and testimonials on my speaking page. If you would like to talk to me about speaking at your next event, please contact me with the form below. Thank you Staci, that is very kind. I’m sorry I forgot to respond to this.before. You had me at “I am always one vote shy of impeachment”. Isn’t it interesting how the blog writing evolves into something pure? I’m in that process now. I mean, it was always pure, but in a sense you find who you are in the blog. Your real voice? I’m in the midst of a writing marathon, at the moment, and could be a little crazed. I’m participating in the A to Z challenge and the deadline is looming! Maybe I should be impeached! Thanks for the follow! Read some good stuff a the prayer closet… The evolution process has been fun. And what a good writing exercise to try to make a relevant (and for me humorous) point in about 500 words or less. Blogging is a good stretch. Good luck with whatever letter you are on and thanks for the follow. Thank you so much, Kim. With what is going on in my family’s life right now, it will be hard to follow the rules, but I will try. I’ve nominated you for the Liebster Award. I adore your blog, your candidness, kindness, humor, and wisdom that you put out there to share. If you’d like to accept, please click on the link. Thank you so much, you are very deserving of the award. With what is going on here, I am barely keeping my head above water. I just can’t add to it. But thank you again for your thoughtfulness. I understand completely. We are praying for you and your family. God Bless you all. Thanks for writing this. It will be very helpful. Looking forward to the next blog as well. Do you mind if I re-blog this? Mark, so sorry about the loss. Your faith in Christ WILL carry your through and the pain WILL make you stronger in Him! So much sounds like cliché but our Heavenly Father knows all and that is no cliché! I am a strong and fervent believer in intercessory prayer so I will be praying for you and yours! I love the concept of your blog for it is unique and shows the diversity that the Holy Spirit uses to bring people together! I follow a lot of blogs when I am not writing so I look forward to not just your articles but also to check out your book-related articles. Love in Christ, brother! Bless you abundantly as you continue in your service to Him and all who pass through your site! Thank you Pastor Roland. This is a tough time to keep marching through faith. While my head understands the Father is in control, my heart wonders if he didn’t mess up this time. But I know better and keep picking up the load daily. I pray through my honesty and openness that I can encourage others who are going through life’s challenges. Blessings to you and thank you for your prayers. They mean a great deal. Thank you for the encouragement Dale. I am truly sorry for your loss, as well. I am sure some of the rough edges get smoothed. But my guess is that there will always be some things that catch me (and you) by surprise. Mark, I cannot imagine the hole in your heart left by the loss of your daughter. I admire your courage in sharing your grief with so many people. My prayer for you and your family is that your words will bring healing and comfort to you and the many others who find themselves in similar situations. God bless you. Thank you, Sheila. We appreciate the prayers very much. Thank you Maddy. I appreciate that and yes, I fight every day for a cure. Pingback: 100 Reasons To Not Kill Yourself: #68 (Guest Post). | You've Been Hooked!